“The echoing sound of “You’ve Got Mail” faded this summer as Google’s Gmail powered past AOL and captured the third place position among email servers. Were the projections correct? Did Gmail overtake Windows Live mail by early 2010? To make a long story short, who knows! That’s right, no one knows. I’m not seeing anything that can be confirmed or figures that compare to what was available last year. The first thing I noticed while searching for updated information was that there is an obvious absence of reporting from my previous sources, ComScore and Netmarketshare. In fact, after two days of searching I ended up going to Hitwise and looking at their statistics for Top 20 Websites & Engines. Gmail, Yahoo Mail, Windows Live Mail and AOL Mail are there, but the number of hits shown for a website is a far stretch to the number of people using that software as their primary email client. Extensive reading tells me that Gmail is making huge strides in some areas. ComScore had a December 2009 press release placing Gmail as Brazil’s number 2 email client but that is not necessarily representative of the rest of us. The figures that are collected by our PC Pitstop servers will only show programs installed on a system. We have no way of knowing which, if any, is actually being used for daily email. That brings me to our Poll. What email client are you using? AOL / LiveMail / Gmail / Yahoo / Other. Please let us now who you use most. I’m also requesting that in addition to participating in our poll, you give me some opinions on what you like and don’t like about the programs that are available. Whether you’ve had trouble finding one you really, really like? Why Gmail blows, that type of thing. 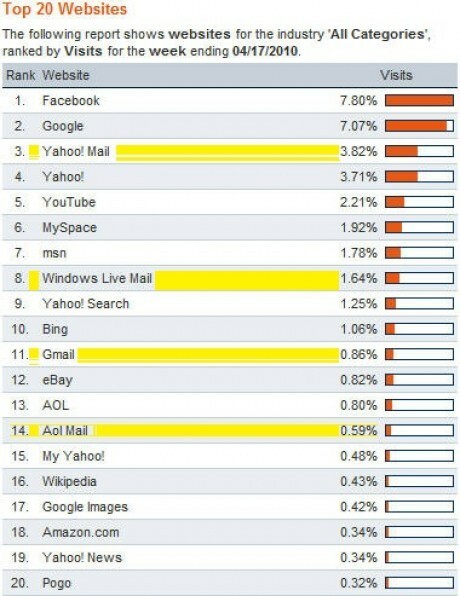 Some of the blogs I’m reading say that email use is declining because of Spam. Social Networking, Twitter, IM, FaceBook and the like are replacing email. Do you think that’s a valid statement? Thanks and remember it’s an opinion so you can’t be wrong. 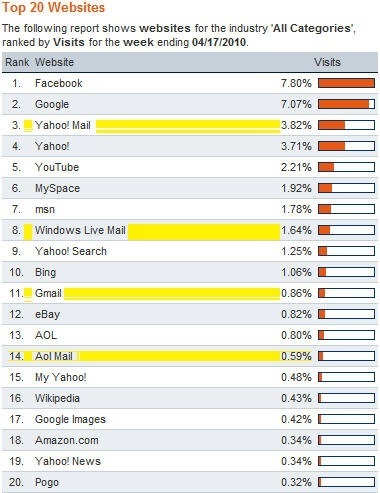 The Pit Blog aol mail, client, ComScore, email client, email servers, gmail, mail, place position, position, you ve got mail. permalink. I use Thunderbird for ISP mail and my websites’ email. I use Hotmail as a throwaway/spam catcher. I think it’s valid when viewing the total number of people using the internet. There’s a big percentage that are young and don’t use email at all. They are a big group worldwide and are texting, tweeting, and facebooking like crazy. I think it’s a smaller older group that uses Email for work and socializing. Your statement, “Some of the blogs I’m reading say that email use is declining because of Spam. Social Networking, Twitter, IM, FaceBook and the like are replacing email. Do you think that’s a valid statement?,” is probably correct. I never use social networking sites because of the inherent dangers (and there are many). Besides, my personal life is private, and I really don’t care to share any of it on the web. Email is at least private, and I am very careful with whom I share my email address. Those who chose to use social networking sites really should get a life. I do wish we could locate all the spam servers and destroy them. They, and the morons that operate them, are the real web cancer. But, like anything else, there’s the good, the bad, and the ugly. My ISP funneled me to Gmail. I like it but on one computer I installed Thunderbird. Gives me more options. I especially like the option to create filters. Color coded my incoming…ie red for important…green for family…can spot what I want quickly. Tried most of the email clients mentioned and will stick here until they mess it up. I use Gmail and Live.com (Hotmail) for “personal” mail and my employer’s ISP for “business” mail. I love Gmail and have been using it for some years. I read it in Outlook Express as I get heavy mail from Yahoo groups. Spam stays on the server and I delete regularly having checked through as some genuine email gets filtered accidentally. I also have a Yahoo and Hotmail address. My main e-mail account is provided by my ISP. However, to control some of the e-mail I get I use both Gmail & Hotmail. No real differentiation as to what gets what. Fran, I can feel your pain. Years ago, I found Outlook Express 6. Told everybody about it. The ultimate email client. Then Outlook arrived. Everything that Outlook Express simplified, Outlook complicated. Anytime a hosting server has to include an explanation on how to set up email on your Web site with an email client (namely, Outlook), you’re going to have major problems. As a Web site designer, I have a client who still uses Outlook and I can’t convince him that this is the reason he has so much downtime. Anyway, to make a long comment short, when I recently installed the delightful new Windows 7 64 bit operating system, I discovered that Windows Live gives you the best of both worlds. The “local client” is based on Outlook Express (Yea!) with some enhanced features. One in particular I really like. Since I filter my incoming mail into folders (a piece of cake in Live), there a great feature at the top of the screen called, “Unread email.” It takes all of that incoming filtered email, puts it into their respective folders, then displays them in the Unread email box along with everything new coming into the Inbox. In other words, everything in one place. No, it’s not the same is simply putting everything into the Inbox because you don’t have to worry about the filtered messages since, after you’ve read them, they disappear from the list the next time you check your email. The new stuff you can filter or delete. Otherwise, I have a GMail account that’s always open in Google Chrome. Part of designing is constantly testing a finished page in all the major browsers (IE8, Firefox, Chrome, Safari and Bing?) and GMail is always open during my surfing session. Using iGoogle for a home page ties in perfectly. It’s attractive, configurable and shows me instantly anything new that comes into GMail; however, the real reason I use GMail is because I have a number of clients who used it, got excited about it and told me about it. I tried it and it’s better (cleaner, more efficient) than Hotmail or Yahoo Mail. BTW, the reason I switched to Chrome as my primary browser? 3 times faster than the rest, I suspect it’s because it’s new. I suspect that the overall leader in email is still ISP provided servers. This article reflects only the online choices, which are definitely gaining ground. When I switched to Windows 7 I couldn’t use Outlook Express anymore. I have tried two others and settled on Gmail. It was the most understandable. Other email clients I tried I couldn’t understand and some did not allow me to receive all my mail. I like Gmail. G-mail;;;Fantastic, it is so easy to use, especially if you use picasa 3 frequently and like to send a lot of photos all at once, i find it so much easier than my other options of yahoo or outlook. Also have it on my 3 mobile so keep up to date on the move with my unlimited internet usage which i find fascinating, my grand-kids think i’m cool knowing all about this techno stuff at my age but truth is at their age’s ( 9 being the oldest ) i still have a little while longer of convincing them that i know what i am on about ! Maybe that’s the fun of it all ! @Bill, seriously, a month isn’t enough? Gmail threatens to delete EVERYTHING in your email if you don’t log on every month, YAHOO gives you a MUCH longer time frame….Gmail shot themselves in the foot with that THREAT so I NEVER use it (although I have 2 accounts). TALK ABOUT DUMB PUBLIC RELATIONS! In the end they didn’t go through with there THREAT, but the damage was done. I also use several email accounts for different purposes. But for the one I use to get the emails I most want to know about quickly, I use Gmail. Why? Because it shows an incoming email without being refreshed (it’s like a live feed), which I think is so very useful. Leave it in the taskbar, and at a glance you can see if there are any new emails. None of the others I use have this ability (Hotmail, Yahoo, Outlook Express, FastMail). I don’t think I’m missing any settings that would provide this feature in any of the other emails I use? Forté Agent and Mulberry have been my email clients for more than a decade(with Firetrust’s Mailwasher Pro as a pre-cleaner since 2004). Neither Agent nor Mulberry is perfect – whar is? – but both are sufficiently configurable to meet my needs. Gmail was a non-starter. Colleagues who formerly worked for Google have told me that no data entering that complex is ever erased. The social networks I’ve looked at seem hideously insecure. I use private email from my own sites. However, I am tied to Gmail as well because I own a Droid SmartPhone, which is a VZ, Motorola, Google Android device that requires a tie to Google. Not comfortable with the Google tie but there’s nothing short of dumping an otherwise excellent SmartPhone to be done to break it. 1. Amount of storage capacity I get . more than anybody, Yahoo or MSN . Or even more than my ISP who charge me over 50 US$ /month to give me some band width. 3. Search-ability: I can search my all the e-mails , I sent or received from any where in the world… Who else provide that service.. I use Spamcop and Thunderbird, while staying away from social networking sites (SNS). Spamcop has captured over 90% of the spam I used to receive. Like # Mary Lynn Kraft (above)I use Spamcop for anything that might bring in spam – catalogue orders, fundraising, donations, etc. I’ve found SNS to be very intrusive in personal information while lacking active and valid preventive measures to protect that information. Due to the litany of security issues Microsoft products experience I stay away from said products as much as possible. I use Gmail, but my main mail is BT Yahoo Mail. I wasn’t best pleased when BT got into bed with Yahoo, but it actually works fine, though without the beautiful Gmail interface and tools. And in fact I have them both fed into Outlook, so actually the mail provider is largely irrelevant. The only time I see them is when I go and check the spam folders (daily) as there is usually at least one message in there that isn’t. But the spam filters work well, I judge, and I almost never get any in Outlook itself. One thing I have noticed is the speed of messaging within Facebook. It’s quite possible to carry on a quick chat within the Newsfeed or in DM; and of course it’s much faster than Outlook. I use FB more and more for messaging, and love the fact that messages also arrive as e-mails so that I can store the ones I want to keep in the Outlook mail folders. We are now spoilt for choice! I use more than one. I like gmail because you can open documents like Word without having Word. I also use the documents for things like Christmas wish lists for my family. I use my own personal email addresses although I do use Google for some things. Yahoo I gave up on and infact banned them from being used by my clients as they block far to much genuine email. AOHELL if not dead already should be shot. I use Outlook and a private domain for most of my email. Yahoo for activity on the net as frankly their spam filters work amazingly well. I would never use a social networking site, I do not trust them to secure my data, and anyway do I want the world to know that much about me? No social websites for me, thanks. Too little control over what other people share about you and who else might be looking. No thanks! I’ve even been trying to get away from email so much and getting back to simply making a phone call or visiting to keep in touch with friends and loved ones. After using Outlook for years, I got tired of trying to keep addresses updated between computers, as well as the delay in downloading emails, especially after being on vacation for a month. I tried Hotmail, Yahoo, Earthlink, and Windstream and finally discovered GMAIL, which I LOVE. It has the BEST spam filter of all of them, and I love having the address book online. The mobile iPhone version is superb to the point I had to buy my wife an iPod Touch. With it’s unlimited storage I never have to worry about deleting any emails. In fact, I use Gmail as my filing cabinet for email invoices, confirmations, etc., and have had to use the EXCELLENT search feature many times. G-mail is a hacker/spammer play land, apparently, as is Yahoo. I’ll never use either and never have! AOL is now the Sears of ISP/hand-holders. Hot-mail (Window Live free) is just that… free, but all I want is a basic email client that doesn’t clutter my screen and is reliable. No complaints! Reliable for years. Log-in regularly. Email will be relegated to ‘dial-up’ status within 10 years given social nets, desire to have a phone do it all, and as a more techy public comes of age. I have a Gmail accunt for things i don’t want to be bothered by. I have not been able to delete it because it wants another email address to forward to. Since it receives orders of magnitude more spam and junk than any other account (80-150 a week or so), I don’t want to give them one. I think it is junk. I’ve been using gmail for several years now, and it is a bit of a love-hate relationship. I love: the Google labs features – folders and multiple in-boxes, labels, multiple email account aggregation, being able to send mail from any account, massive free mail storage (7.5GB), mail filtering, Spam handling. I hate: that there’s no way of viewing stored emails in date/time order only, you have to view them by message thread – that has wasted a lot of my time searching for ‘lost’ emails; and sent mail always identifies itself as coming from gmail, regardless of the email address you use to send your message from. I use Yahoo mail for all the mail that I don’t want to receive spam from. Windows Live is my #1 choice. I seem to be using FB more and more and sendng out less and less emails. I still use Live Mail for all my personal emails, etc. What’s AOL? It seems that more than a decade ago I hooked my computer to a phone and dialed into that. But wow are they really still in business. Overall I prefer gmail because it has always worked with about any email program. Hotmail and yahoo mail are not so easy. To answer your poll I had to answer use more than 1. I use the Yahoo and notsohot mail when I have to sign up for stuff online so that all the junk and spam goes to the one account and I can easily just select all and delete. I just don’t spacebooktwit taking over my email function at this point. I use Outlook Express for personal e-mail and hotmail for anything that might bring in spam – catalogue orders, fundraising, donations, pcpitstop, etc!!!!! !